At the 35th annual Minnesota Public Relations Society of America (PRSA) Classics Awards, Christina Milanowski of Maccabee Public Relations was named the Young Professional of the Year. I started my career as I think many PR pros do: tons of internships. While at the U of M, I volunteered my time for three different organizations and then another one just after college. Luckily that final internship at the legal company, National Arbitration Forum, turned into a full-time gig where I went on to lead all internal and external communications programs from launching an intranet to leading SEO efforts and overseeing crisis communications to pioneering social and blog channels for the company. After being laid off in the summer of 2009, I give great credit to the strong PR community – and you Brant – for helping to guide me into my next job. I’m so thankful to have landed at Maccabee Public Relations where I’ve blossomed from account executive to social media director/account supervisor. I’ve had the opportunity to blend traditional public relations, marketing and communications strategies with the new world of public relations involving YouTube, Facebook, LinkedIn, Twitter, Pinterest and Google Plus, corporate and thought leadership blogs, and content-driven inbound marketing. 2. What role has PRSA had in your career success? PRSA has benefited me so much; it’s given me many opportunities to network and learn from other PR professionals. I have been a member of Minnesota PRSA for more than six years, volunteered on multiple committees, and now lead the chapter’s Membership Committee. I was humbled to earn the chapter’s Young Professional Award this spring reinforcing and giving credit to the value PRSA has provided to me. Anyone working in the local communications capacity should consider joining – and see me with any questions. 3. What best practices have you discovered to successfully integrate social media tactics into public relations campaigns? Over the years, I’ve learned that social media, in its most basic form, is just another channel, but with its own bells, whistles and nuances. To successfully integrate social media tactics, you need to know your audience and how to engage with them; social media allows you to do this in real time and get immediate feedback in ways that continually transform. I believe we learn by doing, and this is one reason our agency is spending a lot of time building up our own blog (the MaccaPR blog, check it out!) and inbound marketing platform. The most exciting part for me is to see how other companies are using it successfully partnered with the ever changing channels and features. These are things that I translate for my clients – in different industries and corporate settings – everyday. 4. What is your desired career path? I want to make sure I’m continually learning. I have an intellectual curiosity that is, perhaps, why I’ve found myself so active in attending local PR events and why I’m enrolled in the St. Thomas Masters of Business Communication degree. Where I go from here isn’t exactly clear, but I hope to evolve and learn with my clients and my team at Maccabee. They have fostered my growth and continue to support my development in areas previously unknown. I love the freedom that a small agency like Maccabee provides to learn on the job and forge my own path. I have a lot of people to thank for the coaching and encouragement that has gotten me to where I am today. 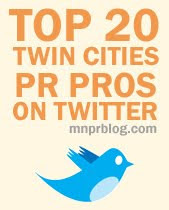 I would like to thank the Minnesota public relations community! There are several people here to which I owe a great deal. We are an inclusive community that supports and challenges each other to improve and learn from one another. I owe it to PRSA for building my relationship with Brant and others, and am thankful for the opportunity to share in my successes. Follow Christina on Twitter or connect with her on LinkedIn.